In a previous article, Interval Riff Basics, we looked at and heard examples of using only two notes, or intervals, for rhythm guitar parts. The two main intervals are fifth and thirds, with the latter adding more variety and color to your riffs. Now we’ll look at ornamenting these two basic sounds with melody fragments. Doing so also introduces other intervals, including seconds, fourths and sixths, but each will be subservient to our core intervals of the third and fifth… at least for now. There are two types of notes in music: chord tones and non-chord tones. Our ornamentation will be done with non-chord tones, specifically the one called a “neighbor tone”. 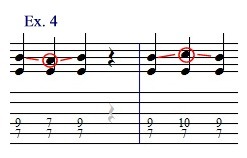 A neighbor tone is next to a current chord tone, and is approached and left in opposite directions. 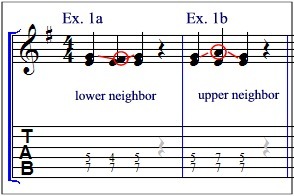 For example, if holding an E minor third (the notes E and G), and the upper note, G, drop down to F#, and then back up to G, the F# is a neighbor tone. See Example 1a. Of course, it’s not necessary to connect the third and fifth at all. You can simply alternate. Adding ornamentation is a good way to introduce melody to your rhythm guitar parts, but we’ve only scratched the surface of what can be done. In a future article, we’ll explore counterpoint and see how to write two different lines for one guitarist to play alone. In Part Three, we introduce counterpoint. To hear and see some interval riffs in an actual song of mine, watch this video of my song “Crunch Time”. The riffs are in the upper left guitar part onscreen.